Wide tunic dress with mandarin collar and button closure. The Dazzle dress has short sleeves, side pockets and a straight hem. Comes with an optional belt. 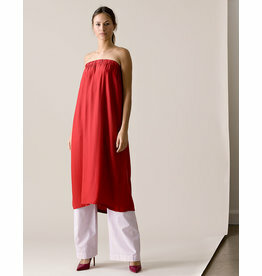 The dress is made of 100% silk in a stunning persian red colour, can be worn all year around. Super comfortable red/white/blue stripe short sleeved shirt with a mandarin collar and hidden button closure and shortvsleeves, box pleat at the back. Model wears a size 36. Relaxed slate silk skirt with side pockets and elastic waist, very comfortable and perfect for summer. Can also be worn as a top, see picture. The length of the skirt is just over the knee, model wears a size 36. Relaxed lightblue / white striped skirt with side pockets and elastic waist, very comfortable and perfect for summer. Can also be worn as a top, see picture. The length of the skirt is just over the knee, model wears a size 36. 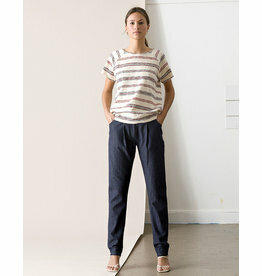 Comfy sweater with short sleeves with raw edges in a red stripe melange cotton jersey , round neckline, dropped shoulders. Button up shirt dress in soft off white gauze with a lurex thread, ideal for summer! the fabric is made of 100% cotton, has side pockets and a stand up collar. Comes with optional striped belt. Sits on the knee, relaxed fit. Button up shirt dress in soft lightweight lightgrey fabric, ideal for summer! the fabric is made of 100% cotton, has side pockets and a stand up collar. Comes with optional striped belt. Sits on the knee, relaxed fit.